@ModelRocketGuy’s Year In Review: April 2018 – My Model Rocketry World! Hi everyone… thanks for being patient while we come to the end of the new year. Since April, which contained my last post, I had been working on several things that I am pretty excited about. First off was getting that LOC IV and Eliminator fixed and pushed for Easter Sunday, which was successful at my local launch for CRASH! Around Mid April, I was able to finish the following rockets! I finished my Estes Cosmic Explorer and my Estes PS2 Ventris. It was at this time, I had decided that I wanted to pursue my NAR Level 2 Certification. I had already decided on a rocket. I was planning on building the Lightning Bolt by Binder Design. The reason I chose this rocket was mainly for its size and its ability to fly on J motors with no issues. Binder Design does a GREAT job of providing high quality parts as you can see from the parts layout above in my Instagram post. I initially was going to build this along with 3 other potential rockets for the Level 2 Certification, however this rocket won the coin toss. I’ll talk more about this in my July Update! While working on that, I tried getting the paint scheme right and how I wanted it for the Estes Renegade E. Now… Estes doesn’t actually “make” a Renegade E. They had this Renegade as a two stage rocket, and then it was converted to a Renegade-D. This… is fitted for a 24mm E motor, and also has an Estes 24mm Motor Retainer (I HATE engine hooks). 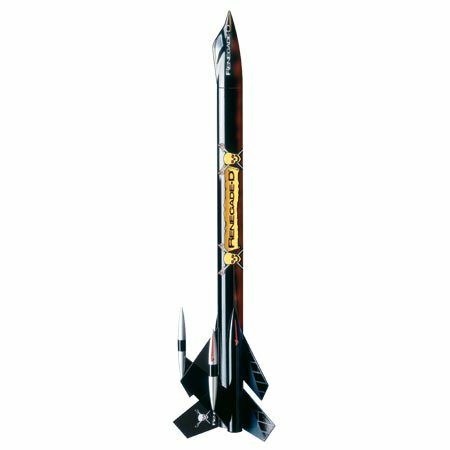 If you look at the flash of this rocket, you can see the red on the under body of the rocket, hence why I tried to make this the same. Here is some flash of this rocket from Google. The Estes Renegade-D is a pretty cool rocket. To tell you the truth however, I still have YET to finish this as of this writing (Dec 2018), however I will get it done! In building and working on multiple projects, mostly of my Level 2 Rocket, I found I had to get some more tools and items worthy of working on the rocket itself. Everyone talks about adhesives. There has been numerous articles, forum and Facebook threads containing do’s and don’ts from tons of great modelers and builders. It’s a double edge sword for whatever reason talking about adhesives. So I took advise from some of the instructions and talking to Mike Fisher, owner of Binder Design rocketry, and he suggested to use Long Cure epoxy with Milled Fibers. What the hell is that? Why do I need that…? Well. It’s literally grown fiberglass that is in a “dust” form. Mixing this with epoxy strengthens the joints on rockets where it could suffer the most impact. In this case, I had NO IDEA where to find it. After one of our club’s CRASH launches, I went to Action Hobbies Colorado in Lakewood, and found THIS! I gotta tell you… this little 4oz bottle has been used with EVERY epoxy mix since then. I highly recommend you get some. The best place to get this now is probably US Composites, as buying the Great Planes brand will go obsolete because of the Hobbico buyouts. The difference between THIS and MicroBalloons, from what I understand is… Milled Fibers become part of the epoxy reaction, and bond coherently with the two parts of epoxy, the hardener and the base. This allows the adhesive to act such as WoodGlue Max or Titebond 3 would work for wood glue. MicroBalloons are used as a filler, for spacing, which is why you’ll see it used on aircraft hobbies or even rocketry fillets. I won’t use MicroBalloons on fillets UNLESS the inside structure of the rocket is mended well enough that you don’t HAVE to have fillets on the outside. Interesting right? Well, check this out! Picture 1 on the left of the cutaway LOC Goblin shows a “FULL ON” epoxy adhesive. If you think about this… you could fly this 54mm rocket on a K motor… easily as this joint has now become part of the entire airframe. With something like this you would NOT need an external fillet. The guys at LOC have proven this several times at various launches and have had no issues in broken anything. My point here is, since the joint is heavy on the internal motor tube and fins, AND connected, you would NOT need an external fillet here. However… if you DO put a fillet on, use MicroBalloons to make your epoxy thicker, less runny, so you can “shape” the fillet easier. Picture 2 on the right of the the cutaway LOC Goblin shows a “standard” or normal epoxy joint. This is the kind I would use. Theory behind this… is… you’re making an internal joint directly to the body tube. I would use Milled Fibers here (if you want, your choice) and then use MicroBalloon on the external fillets. The milled fibers, will be used for strength, and the MicroBalloons will be used for “filling” and aesthetic of the external fillet! This is my current recommendation for cardboard tubing. I haven’t dabbled with fiberglass builds to know much about how that would work at this time. More to come of course. I will probably do a blog just on this adhesive discussion soon! At the end of April, I went on a selling spree. Getting duplicate rockets OUT of my build pile. At this point, I was sitting at over 100 kits, still boxed or bagged, and I felt greedy. A ton of you found these on eBay and that’s okay… I hope you have all started some of them! Yeah… there was a lot of them. I think I sold approximately $500 worth. That sums up my April! I am hoping to get more time to blog about May soon! A ton of stuff happened in May… including THIS! We have a lot to discuss. I know. Till then, thanks for reading and tell your friends!